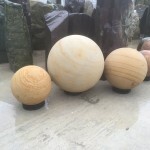 Sandstone Spheres drilled to create an infiity water cascade effect, perfect for those looking for something truly unique in their gardens. 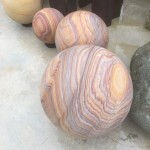 Infinity sphere water features are available in Rainbow sandstone and our golden buff sandstone. The spheres are drilled twice through the center to conceal the entrance of the water to the sphere, then a secondary drill is used to create a large opening at the top of the sphere. This creates a beautiful cascade of water down the side of the spheres. Available in 400 and 500mm spheres.